"Your guests will be amazed and delighted when they taste this elegant dessert. Very simple to make too! Also very versatile because you can adapt it to any occasion by virtue of added ingredients -- chopped toasted almonds or pistachios, shaved chocolate, chocolate curls, toasted coconut or maraschino cherries on top. For Christmas add chopped green and red glaceed cherries between layers and on top." Prepare pudding with milk as directed on package. Chill in refrigerator. Whip cream with sugar until stiff peaks form. Fold one-quarter of whipped cream into pudding. In a 9x13 inch dish, spread a thin layer of pudding mixture. Top with a layer of wafers. Spread one-third of whipped cream over wafers. Sprinkle one-third of crushed candy over whipped cream. Repeat layers until all ingredients are used. Chill 2 hours before serving. See how to turn ice cream sandwiches into an impressive ice cream cake! 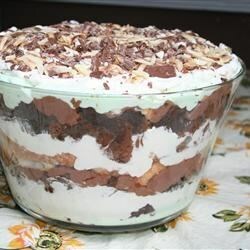 MY GUESTS AND I LOVED THIS RECIPE THE ONLY THING I DID DIFFERENT WAS USED NILLA WAFERS INSTEAD OF CHOCOLATE AND TO MAKE THE CANY EASIER I BOUGHT HEATH BITS FROM THE BAKING ISLE. Okay but not a lot of flavor. I made this using oreo cookies, some chopped up kitkat and heath bars. A few people found it too sweet. I guess the cream between the oreos should br removed then. Not bad i would say. Wonderfully light, a perfect dessert following a heavy meal.